The next Lambeth Peer Support Network meeting will take the form of a working lunch on Friday, May 1st, 1.30pm – 3pm at Lambeth ACCORD Conference Centre, Green Room, 336 Brixton Road, Brixton, London SW9 7AA. Please confirm your place by 24 April with Stephanie, see below. What support do people want from the Lambeth Peer Support Network. How often would people like these meetings to occur. What sort of training or personal development do people need support with. Update on service developments and the Peer Support Hub Launch. 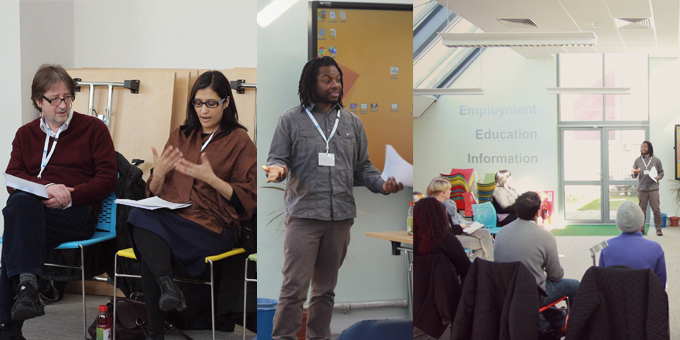 There have been some interesting and thought-provoking presentations happening as part of the network. Social Inclusion has been an important topic – Mark Bertram, Head of Vocational Support (SLaM) shared the report Intergrating vocational and peer support: an exploration – VIP, at one event. Meanwhile, peer supporter Manju Rajput built on this when she led on Social Inclusion at the following meeting.